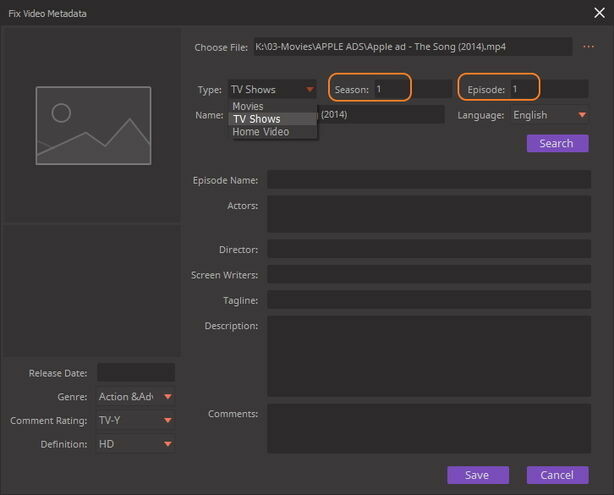 Metadata describes video specifics like video name, type, language, release date, genre, etc., which helps to sort and organize your video collection. If your video file has incorrect or missing information displayed when being played, you can follow the video tutorial to learn how to fix or edit video metadata. 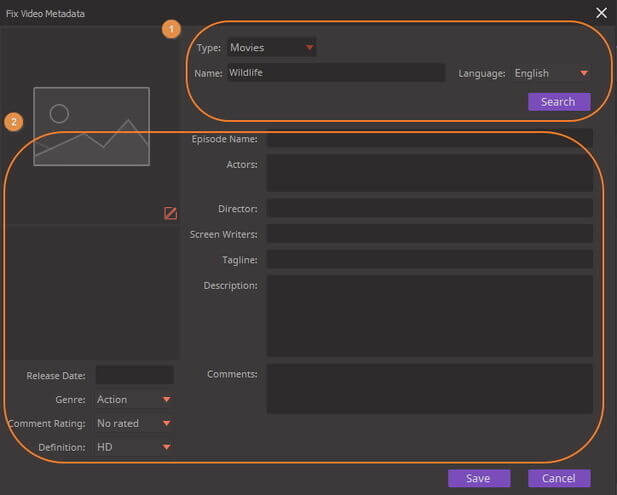 Generally, there're 2 ways for you to access the built-in video metadata editor. This way applies to editing any video metadata. But to save the edited metadata, you must convert them to either one of the following output formats. For Windows version, it supports MP4, MKV, MOV, M4V, AVI and WMV output formats. For Mac version, it supports MP4, M4V, MOV, MP3, AIF, FLAC, IT, XM, S3M, MOD, MPC, OGG, OGA, SPX, TTA, WV, M4A, M4R, M4B and M4P output formats. Launch Wondershare UniConverter (originally Wondershare Video Converter Ultimate) after installation, it'll be under Convert section by default. Click the Add Files button at the top-left corner to load your desired videos for editing metadata. Then you'll see the video thumbnail in the primary interface. Click on the icon circled as the above screenshot shows, you'll get a separate window for Fix Video Metadata. 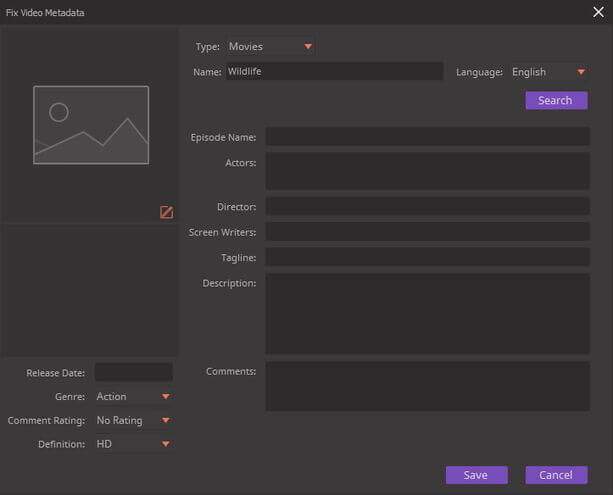 Now you can proceed to video metadata editing at will. Basically, it can be divided to 2 sections. 1. Section 1 contains Type, Name and Language, you can either edit it manually or click Search to fix it automatically. Note there're Movies, TV Shows, Home Video 3 choices under Type, and if you choose TV Shows, you'll get Season and Episode option. When you complete all the metadata editing, click Save to confirm. 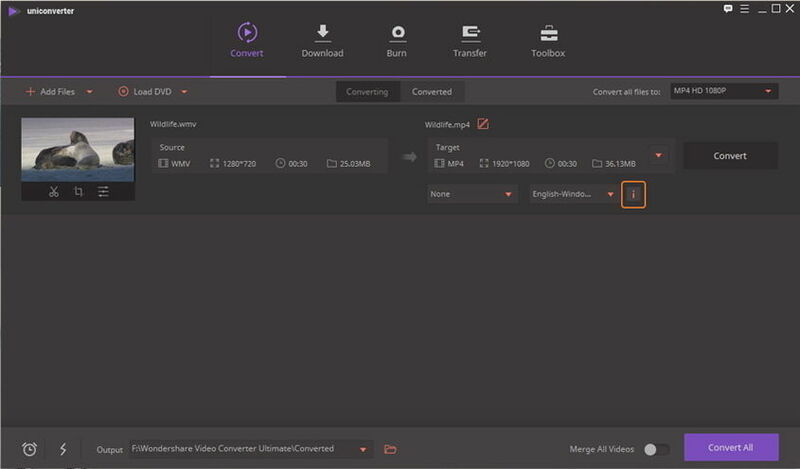 Then click Convert All save the changes in the converted videos. Different from Part 1, this way goes for a limited input video formats as below and requires no extra converting steps. 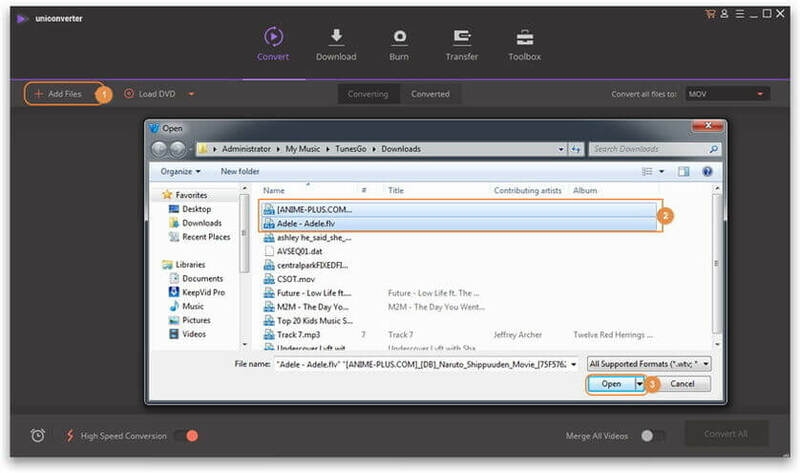 For Windows version, it supports MP4, MKV, MOV, M4V, AVI and WMV input formats. For Mac version, it supports MP4, M4V, MOV, MP3, AIF, FLAC, IT, XM, S3M, MOD, MPC, OGG, OGA, SPX, TTA, WV, M4A, M4R, M4B and M4P input formats. 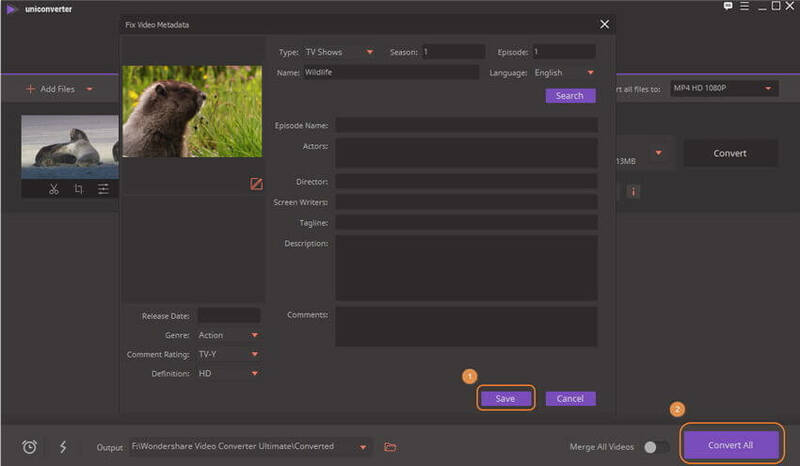 Launch Wondershare UniConverter (originally Wondershare Video Converter Ultimate) after installation, then go to Toolbox section and click Fix Video Metadata under Media Tools category. Click … button to add the video that you want to edit metadata. 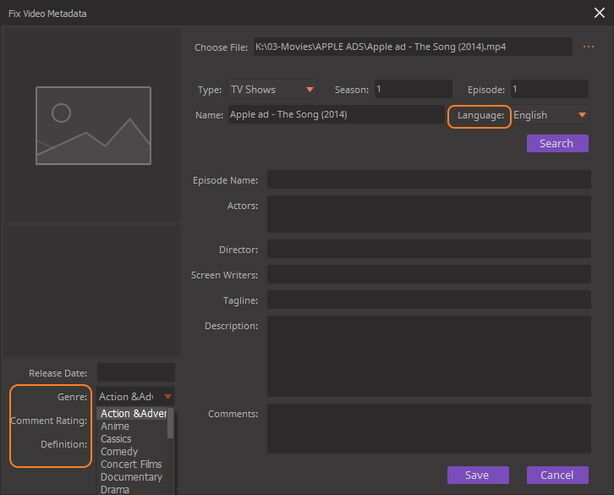 Now you can fix, edit or add metadata to the video from the following 3 aspects. 1. 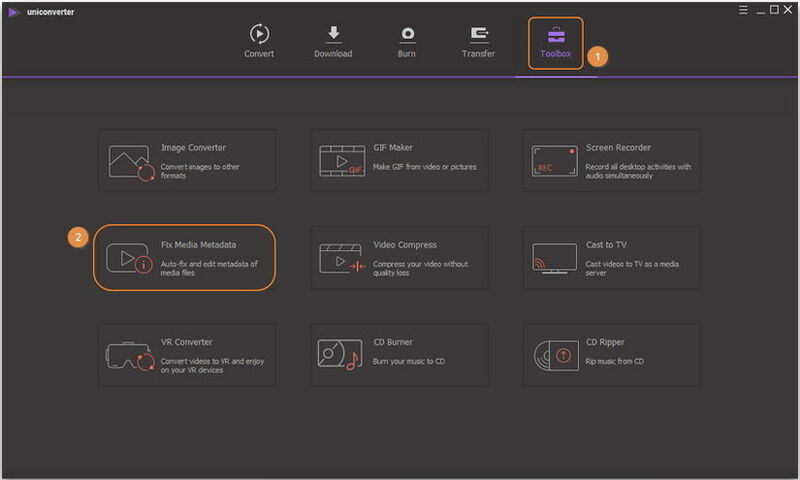 Wondershare UniConverter automatically detects the video type and falls into Movies, TV Shows and Home Video. You can change it by clicking the drop-down button for Type. 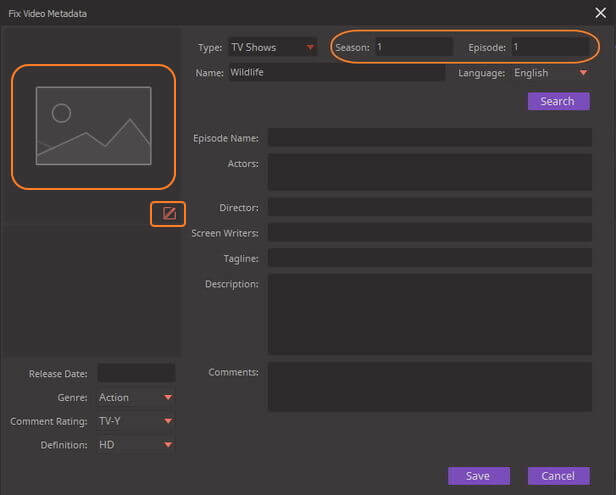 If you select TV Shows, you can edit Season and Episode beside Type option. 2. As to video language, genre, comment rating and definition, you can select a proper option from the drop-down list. 3. For additional information like actors, directors, screen writers, tagline, description, comments and release date, you need to add them in the blank yourself. Click the Save button when you finish editing video metadata. 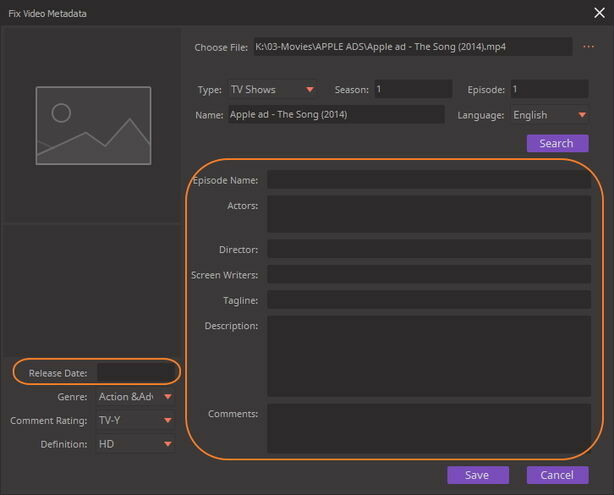 Now your video shines when played on devices or programs that read the metadata.